I found a recipe for a lemon cake with coconut flour I wanted to try - Gluten-free Coconut Flour Lemon Cake. But as nearly always with recipes I find, I had to make some adjustments. I had no xylitol and didn't want to buy it, since I already have a variety of sweeteners. I used a blonde coconut blossom nectar instead. It has a sourly fruity tone, I thought would fit to a lemon cake. My pan did not have the size mentioned in the recipe. It's a bit larger. So I used the 1.5x amount of some ingredients. 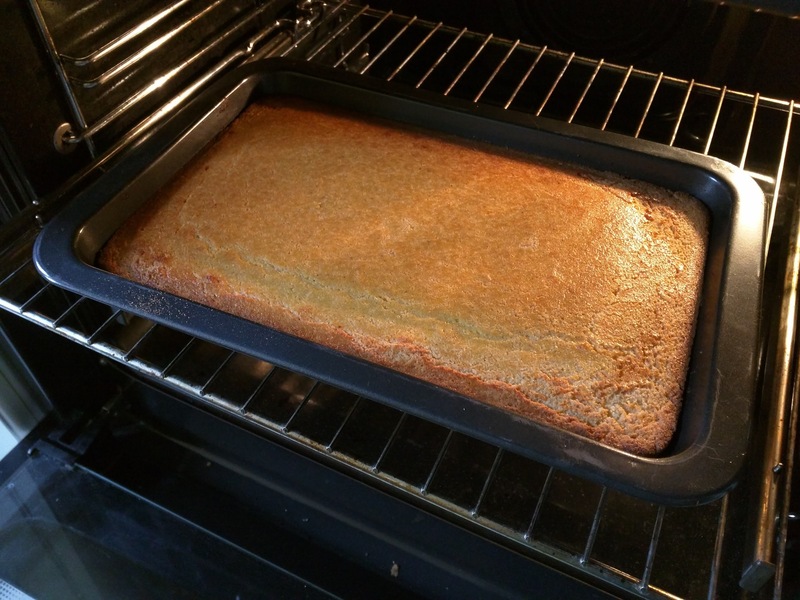 Since I like lemon cake very lemony I used the juice of a whole lemon and the zest of two. Preheat oven to 175 °C. Measure out coconut oil and place in an 21x30cm pan. Place pan in the oven to melt the coconut oil. Once the coconut oil is melted (check while mixing the other ingredients), remove the pan from the oven and let it cool. 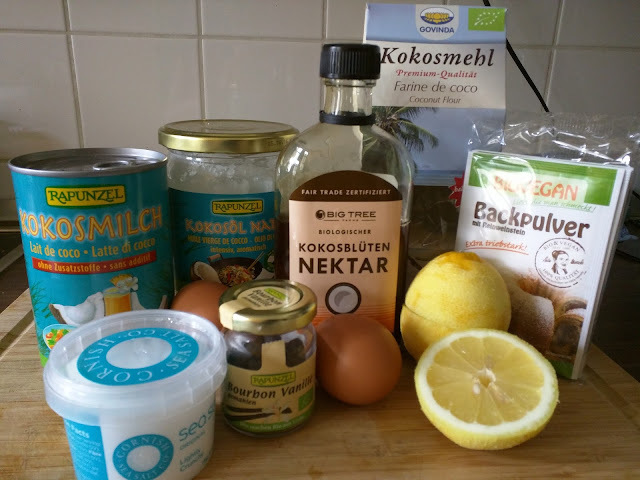 Whisk the eggs, coconut milk, coconut blossom nectar, lemon zest and lemon juice together. Sift the coconut flour (sometimes there are lumps in it) into a seperate bowl. Add the baking powder, ground vanille and salt. Combine the dry ingredients. Stir them into the wet ingredients. Once pan with melted coconut oil is cooled enough to handle, carefully slope pan so the coconut oil also greases the sides of the pan. After that pour the coconut oil into the batter and mix until all lumps are gone. Pour the batter into the greased pan and place on the middle rack of the oven. Bake for 30 to 40 minutes, until browned on top and a toothpick comes out clean. Let the cake cool a little, but add the frosting when it's still warm. Combine coconut blossom nectar and lemon juice until the former is completely dissolved. Drizzle over the cake. When pools a building, use a spoon to spread evenly.